I am a big advocate of the idea that we can reason through our emotions. This is not meant to be a dismissal of the idea that some emotions creep up under the security systems of logic. Sometimes we just feel things; sometimes those things have no discernible origin. We wake up in a bad mood. We just go from feeling just okay to feeling melancholy. Still, I would argue that these things don't happen for "no reason;" they simply happen for reasons that are not apparent to us, consciously. If we thought hard, we might be able to trace the reasons. But, sometimes, we are simply unable or unequipped to do so. Sometimes we seem to feel things for "no reason." What's left is to reason our way through whatever we feel. 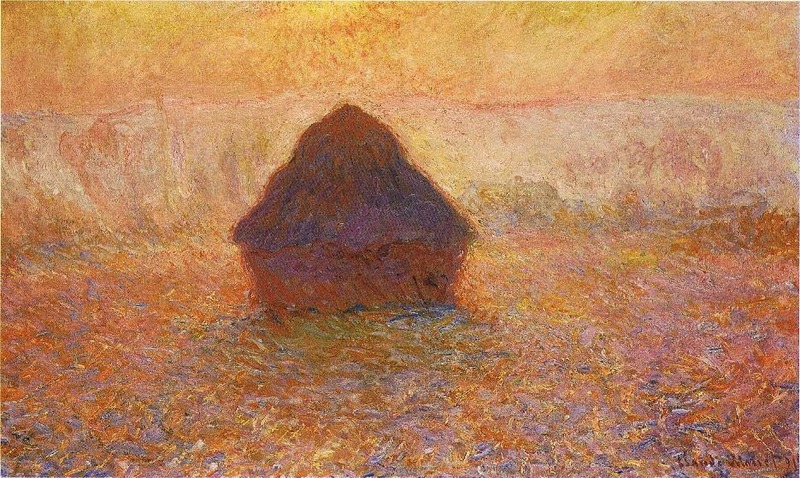 Monet: "Wheatstack (Sun in the Mist)"
I spend all summer in school, making schedules and planning for the upcoming year. I am there, already -- but that little kid feeling comes back anyway, unbidden and illogically real, like a curtain of gauze. So what does logic tell me to do? Just get up and do it. It's not a big hurdle; it's not a serious problem. But is might be a tiny example of those emotions we feel but can't pinpoint. So, I teach my sons, when they express the feeling: "I don't want to go back to school, Dad. I don't want summer to end." So I tell them, not unkindly, not sarcastically: "You and every other kid in the country, buddy. You just have to put your nose down and do it." It's a microcosm for our lives, right? When I feel emotions that make me want to lie down and feel sorry for myself, the answer is usually: Just get up. What's the alternative? The alternative is always either quitting or hiding and neither one is ever acceptable. So, we go back to school and we work and we get tired and we "re-create" ourselves over holidays and breaks. We look forward to sunbursts after rains; we resign ourselves to periods of grey, knowing they will end. We recognize cycles and we go on. What's the alternative? Is it acceptable? Of course it's not. We "go back to school" and we live each summer as if it will be our last, because, the truth is, one day, the last summer will come. And that's okay. Who knows? We can all hope a better season than we can imagine comes after the last summer. So, we grab our books and pencils and trudge through the school doors, no matter how we feel. The alternative is unacceptable.